I really enjoy Valentine’s Day. Every year I secretly get excited to wear something pink or red and I love trying to think of something sweet to get Alex. That being said let me clear the air. Much like Christmas I prefer to give rather than receive. Sure, if Alex wants to buy me a heart shaped Reese’s Cup, I won’t turn him down, but I certainly don’t like a fuss to be made. I don’t feel that Valentine’s Day is a day to punish the single. Do you care about your Mom or Dad? Give them a valentine. Do you love your dog or cat? Give them a valentine. 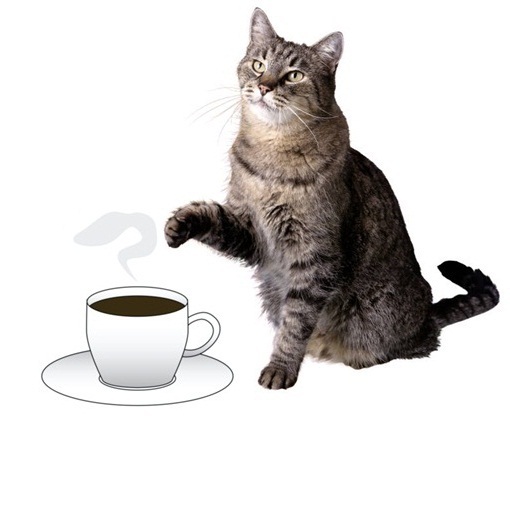 Don’t make a fun holiday a reason to be a grump; there are plenty of other things in life perfect for doing that. I see no reason to celebrate reminding someone that you care. I hear people say constantly “People shouldn’t need a holiday to tell someone they care!” Then why have Easter if not to remind us of our religious responsibilities? Why celebrate Christmas if we aren’t going to give our loved ones gifts 365 days per year? Why celebrate our birthdays? The list could go on. Just relax, have some chocolate and enjoy being able to wear pink and red together without feeling tacky. On to the topic of the hour: Alex’s V-Day dessert! A die-hard Snickers bar lover, Alex has professed his eternal commitment to this candy bar weekly since we’ve been together. So, occasionally I’ll try to incorporate this treat into one of my usual holiday desserts for him. 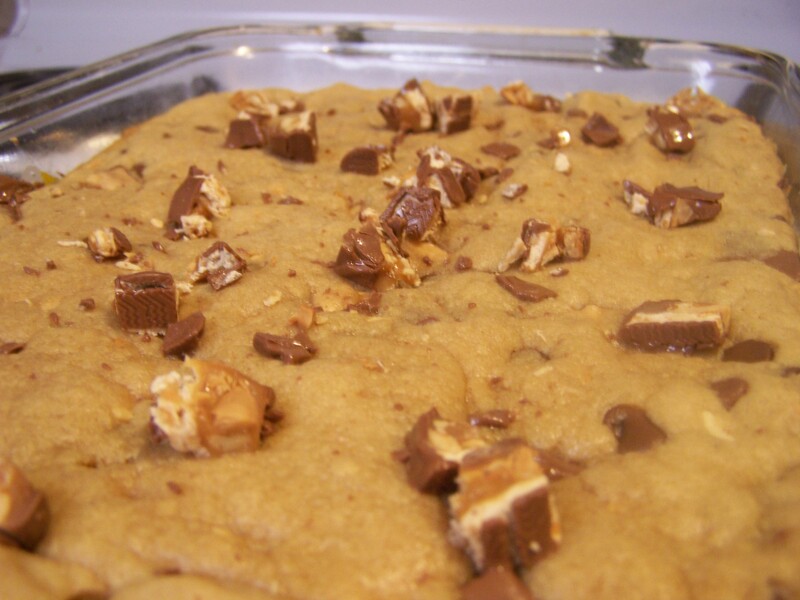 This year, I decided to do Peanut Butter Snickers Cookie Bars. What a mouthful! I nabbed the recipe from Brown Eyed Baker and got to work last night. 1. 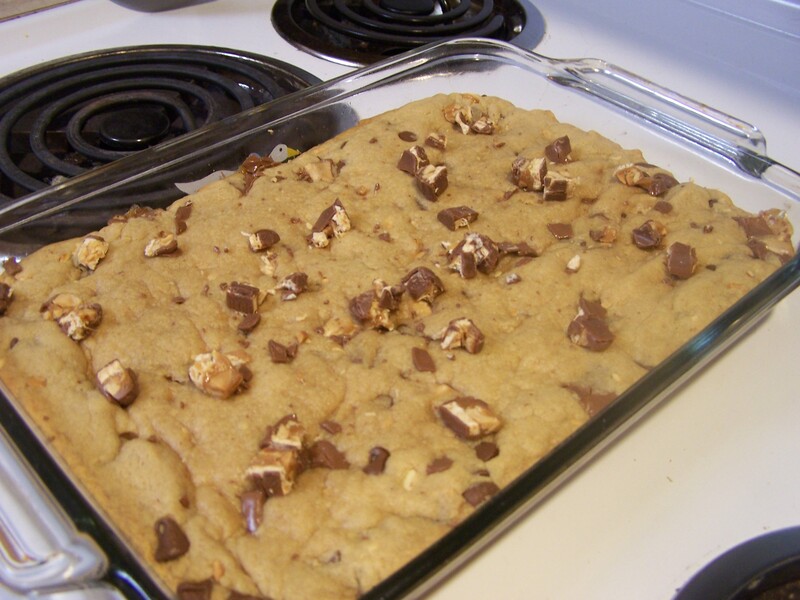 Preheat oven to 350 degrees F. Spray a baking pan (I use a 12 x 8 x 2 size) and set aside. 5. 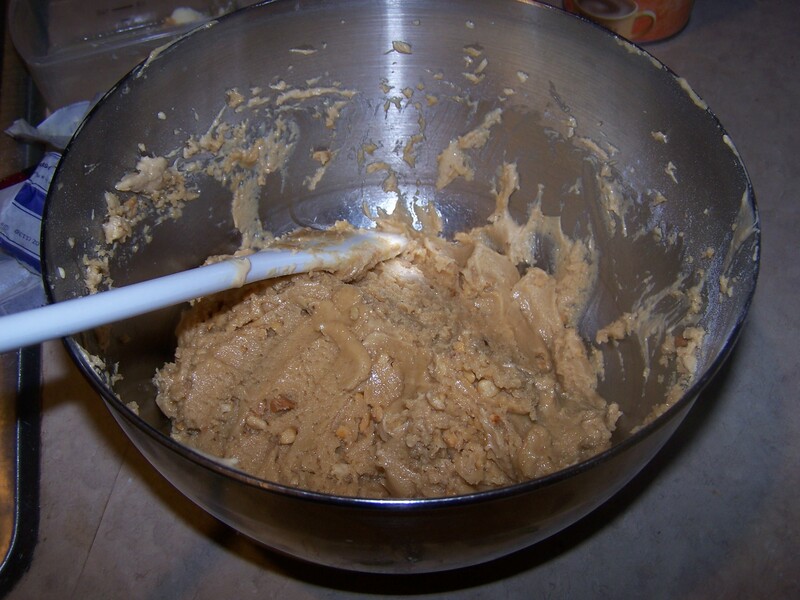 When completely mixed, pour batter into baking pan and spread out evenly. Bake for 10-13 minutes, depending on oven, and take out when sides begin to brown. 6. 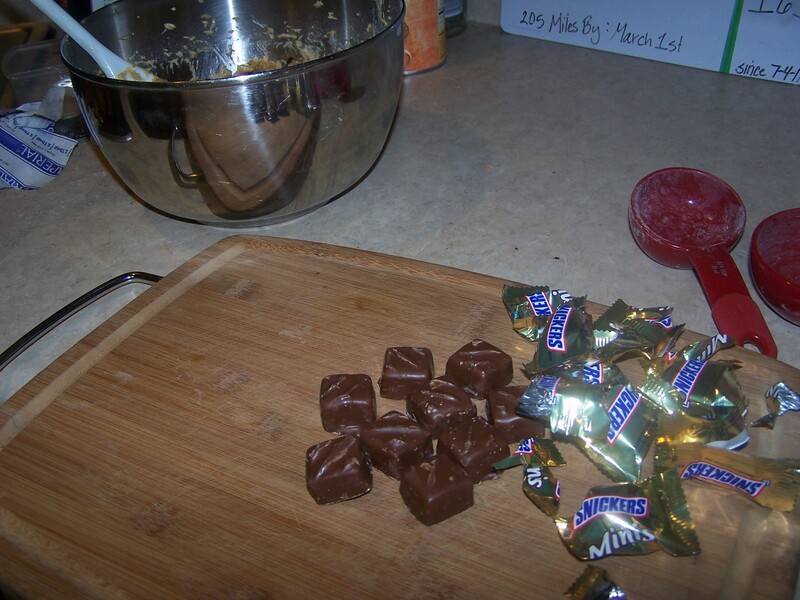 While warm, chop up any leftover Snickers you may have and sprinkle on top. They’ll melt and spread over the dessert, making for an extra kick of sweetness. Cool for 10-20 minutes before cutting into bars. My Healthy Choice of the Day: After tasting three mini cupcakes in my company’s Cupcake War activity, I walked straight back to my desk, downed a glass of water and did 50 lunges. Desk push-ups and squats to come!